ICDI, Integrated Community Development International, has changed its name. A letter from founder and CEO, Jim Hocking, announces how the new name, Water for Good, is the capstone for changes made over the last few years in order to be the best stewards possible of the resources entrusted to them. After years of steady growth and much reflection, we have decided to sharpen our focus on providing reliable access to clean water and supporting community-led projects. We turned over the management of the orphan care centers to our partner, Vision Trust International, who will continue that amazing work. The HIV/AIDS training is no longer a separate program, and instead we use the lessons to improve our well committee training. These transitions allowed us to “go deeper” in our commitment to work with villages to maintain their water sources and share God’s love with them. As we began to implement these changes, in March of this year, the Seleka rebel forces advanced, spreading chaos and violence. This period tested our vision: did we build an organization with empowered African leaders who could weather and manage a crisis. Our staff and the outpouring of support from donors rose to the challenge! We restarted operations in May with record-breaking results! More than 100,000 people gained access to clean water just this year! We have also continued our work to improve operations: increased efficiency of all our programs, reduced total administrative expenses by 30 percent, and the staff in the Central African Republic has assumed greater leadership. “Water for Good” celebrates and reflects our mission to use clean water to transform communities in Central Africa. We provide access to clean water because it improves health and demonstrates God’s love in a tangible way. Your support allows our teams to work with communities to keep the clean water flowing, year after year. Our service teams make regular maintenance visits to each well and build relationships with communities. Then, through these relationships, we can support projects in agriculture, health, and small business that make the village more prosperous and able to pay for the long-term maintenance of their well. With “Water for Good,” communities can take ownership of their water sources and work toward a better future. 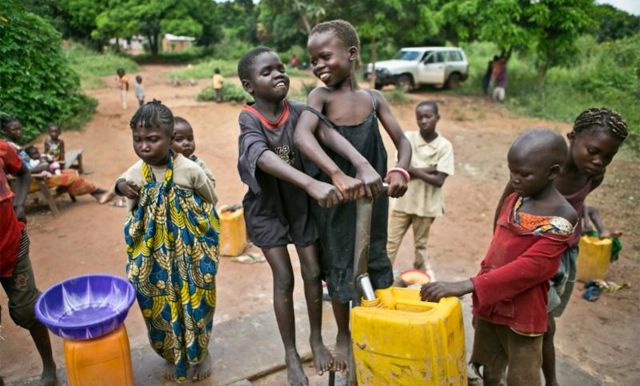 The Central African Republic is one of the most neglected countries in the world. Together we can help bring hope to people who thought they were forgotten. Water for Good/ICDI is a cooperating ministry in the Fellowship of Grace Brethren Churches.